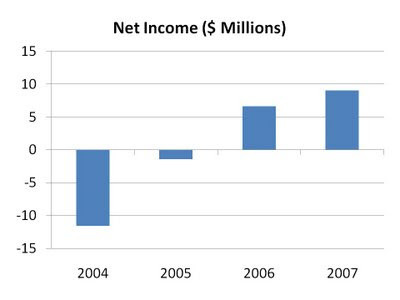 While most companies lose 35-40% of their income to tax, Spark Networks actually gets to double its income in 2007, and pay very little tax in 2006! Clearly, this is not sustainable. A careful reading of the notes reveals this tax gain is a result of making up for past operating losses, and that a large chunk of these tax assets have now been used up. Applying a normal tax rate to the 2007 before-tax income would suggest a trailing P/E of around 30, rather than the appetizing 9 currently displayed by your favourite stock screen. Does this mean Spark Networks is overvalued? Not necessarily, but as value investors we like to buy companies that consistently make money and sell at discounts to their intrinsic values, and LOV hasn't proven it measures up to either of these criteria.